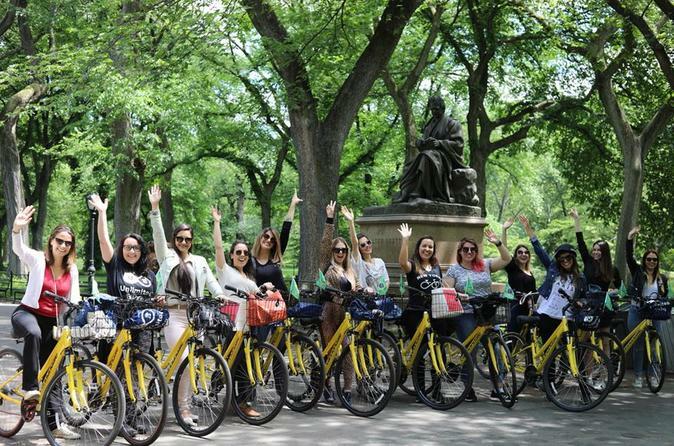 Enjoy an easy bike ride through beautiful Central Park in New York City, admiring top attractions including Bethesda Fountain, Strawberry Fields, Belvedere Castle, Cleopatra's Needle and the Sheep Meadow. Choose from a 2-hour morning or afternoon tour, and learn about the magnificent 843-acre (341-hectare) park from a local guide as you cruise along its gently winding paths. Suitable for all fitness levels, the relaxing ride is an excellent way to cover lots of the park's most famous landmarks in a short span of time. Meet your guide just a couple of blocks south of Central Park on West 56th Street for your morning or afternoon bike tour. Select a hybrid bike, appropriate for your skill and experience level, as well as a helmet and map of the park. Then, peddle along at a leisurely pace on both paved roads and unpaved trails as your guide talks about the park's history and its many famous attractions. Your guide broadcasts his narration to group through a speaker, so you won't miss any details. Admire popular landmarks including ornate Bethesda Fountain, the ancient Egyptian obelisk known as Cleopatra's Needle, the massive green space of the Sheep Meadow, and the lovely Jackie Onassis Reservoir in the northern part of the park. See the tribute to the Beatle John Lennon at Strawberry Fields as well as The Dakota, the New York City apartment building where the singer once lived. Delight in views of Belvedere Castle, smell the flowers in Shakespeare Garden, and ride by the Swedish Cottage Marionette Theatre where one of the last public marionette companies in the US operates. Pause for photos and replenish with bottled water (own expense) as you travel 7 miles (11.2 km) through the lush and lively park. Your leisurely 2-hour Central Park bike tour ends back where it began, just south of the park.